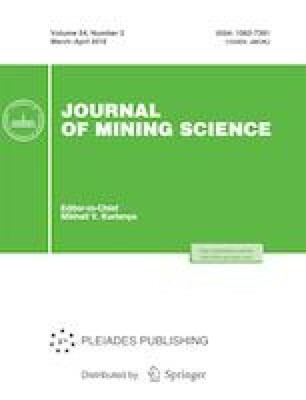 The results of the research aimed to substantiate parameters of loose ore and rock mass (protective cushion) formed to protect and isolate underground mines from the open pit mine at Udachnaya kimberlite pipe under mining with the caving methods are presented. The thickness of the cushion is determined based on the effect of an impact of caved rocks and the resultant air blast, and is meant to isolate aerodynamically and thermally the open pit and underground mines. The thickness of the protective cushion is calculated with regard to an increase in the depth of mining down to a level of –680 m.
Original Russian Text © I.V. Sokolov A.A. Smirnov, Yu.G. Antipin, I.V. Nikitin, M.V. Tishkov, 2018, published in Fiziko-Tekhnicheskie Problemy Razrabotki Poleznykh Iskopaemykh, 2018, No. 2, pp. 52–62.